The number of San Diego County students expelled or suspended for making a “terrorist threat” has increased, according to data from the California Department of Education. Facebook, Burnbook, Yik Yak are some of the social media sites where schools and its children are becoming targets for violent threats. Last November, on the phone app Yik Yak, a user stated there would be a shooting at Torrey Pines High School. The next day, a 17 year old, was arrested for the threat. Most San Diego County school districts say they don't track the number of violent threats they receive. But according to data from the California Department of Education, during the 2011-2012 school year, 62 students were expelled or suspended in San Diego County for making a terrorist threat. That number jumped by 35% to 84 students last school year. Click here to search the online database. Those figures take into account only students who were caught making terrorist threats. The number of general threats is greater. 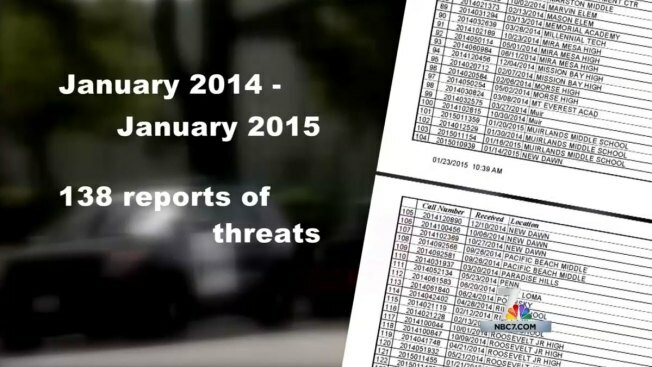 From January 2014 to January 2015, schools in the San Diego Unified School District alone received 138 reports of threats to individuals or schools. Click here to see a database of the threats. Frequent threats led the San Diego District Attorney’s office to assemble a multi-agency team to analyze threats and stiffen penalties for those making them. Last month, Dumanis announced her support for Senate Bill 456. It would create a specific crime category for threatening to fire a gun on a school campus. It also would allow for a one year jail sentence and a fine up to a thousand dollars for verbal, written or online threats against schools or students. If the threat results in an emergency response by law enforcement, the bill would also make the person convicted responsible for paying back the cost of those resources. NBC 7 Investigates asked law enforcement agencies how much it costs when they respond to a school threat. But NBC7 Investigates was told exact figures are not tracked. Costs could only be estimated, and according to the San Diego County Sheriff's Department, they add up quickly. NBC 7 Investigates also tried to find out who what happens to juveniles arrested for making school threats. But the juvenile court judge overseeing the Torrey Pines Yik Yak case denied NBC 7’s request to attend the hearing. The only information released from law enforcement was the 17-year-old was not a Torrey Pines Student. Senate Bill 456 was introduced by San Diego State Senator Marty Block. It passed the public safety committee in March and could come for a full senate vote this month. NBC 7 Investigates contacted Facebook, Yik Yak and Burnbook for a comment regarding school threats; no one from any of the companies responded to our emails.